On December 23, as I was beginning my holiday break, I (like so many of my colleagues) was stunned by the headline in The Washington Post: U.S. plans raids to deport families who surged across border. That news sent shock waves through immigration communities as we saw the White House empowering the rogue agents of ICE. The Obama administration officials who concocted this scheme know very well the devastating impact the idea of raids has on immigrant communities. “Do you think ICE agents will come looking for us?” my mother asked before as I left their house. As I stood in the driveway, visibly annoyed, I told my mother that nobody would be looking for her, and that whoever tried to deport her would have to go through me. This is not an unfamiliar scenario. My parents have asked the same question to me since I was a senior in high school, and I have always put forth any type of answer that would appease their fear of being detained or deported. However, after receiving the following text message from my mother late last night, I knew that I could not keep hiding the truth from them. My parents are deportable from the moment they wake up to the moment they fall asleep. This singular realization is the one that causes them to worry as they drive to work in the mornings, and the same one that keeps them up at night wondering if immigration agents are after them. Like many immigrant families out there, my parents have good reason to be scared. They do not qualify for President Obama’s stalled DAPA program, the one that would shield parents of U.S. citizen and legal permanent residents from deportation, and they are constantly showered by insults and attacks from Republicans in the media. Throughout the years, I have often tell my parents to look on the bright side—that at least President Obama got DACA done, so that my brothers and I could attempt to live a semi-normal life. But by announcing the raids of homes of immigrant families, President Obama undermines all of my efforts to keep my family hopeful and strong. A cold slap in the face, reminding immigrants that they can be forcibly removed from their homes without warning—and consequently sent to the dangers they fled in their home country. President Obama, his immigration staffers at the White House and Secretary Jeh Johnson are trying to shield themselves behind statements that state that we, the immigrant community, should “not be surprised” by these raids. But I say the contrary. When the Obama administration stated that it would deport felons, not families, I believed it. I fed those claims to my parents, almost as if I was giving them a temporary justification—telling them they had to live in fear just a little bit longer before they could obtain any type of relief. As it turns out, that “little bit longer” turned out to be eight long years filled with record number deportations. Perhaps President Obama is trying to write the final chapter in his legacy as “Deporter-in-Chief,” or perhaps he is doing what he has done all along: continue to instill fear within every immigrant household in this country. I remain thankful that my parents have not been taken from me, but I can’t help but wonder what must the families of those who have been detained and deported feel. These days, when the news cover the immigration raids that are taking place across the country, I can feel the uncertainty and fear growing once again within me. This is an election year, and many candidates are out giving flowery speeches, their views as to what they hope to accomplish should they be the one elected to serve our country. Their proposals are diverse, but when it comes to immigration there is a lot of tension. Democrats are pledging once again to help immigrants, stating that their proposals are the ones that will help bring millions of people out of the shadows. However, I am unsure of how they plan to accomplish such goals—as the current administration was only able to bring us DACA, and that was it. Everything else is on hold, indefinitely. The only thing that scares me more than uncertainty is what the Republican candidates are saying, specifically Donald Trump, Marco Rubio, and Ted Cruz. They refer to immigrants as if we were some sort of plague, proposing that they will kick us out of a country that was built by immigrants. Who can begin to comprehend that? Everyone has come from somewhere, and we have arrived to this country in search of new horizons and security for our families. President Obama, you too have immigrant roots, and you are the leader of one of the most power nations in the world. 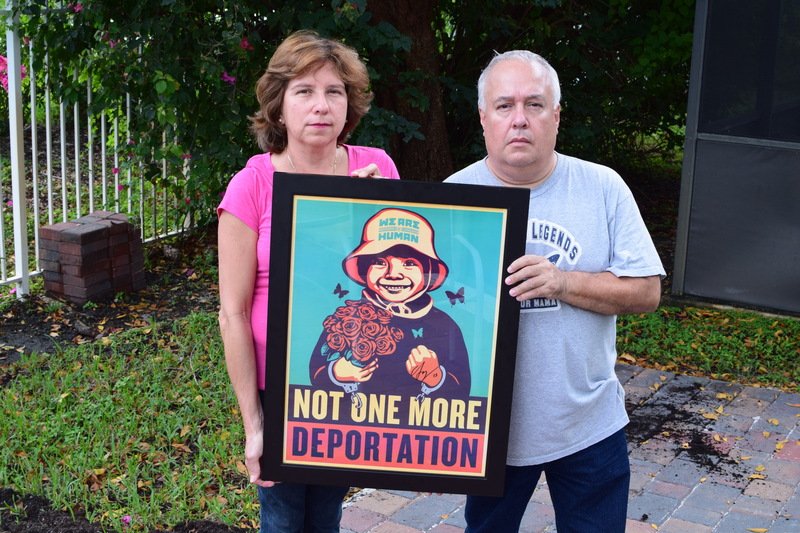 The time has come for you to stop the deportation of immigrant families like mine. Help fix this broken immigration system instead of spreading fear among the undocumented community… The majority of us are good people, we are honest and hardworking, not to mention that we abide by the laws of this country. To Mr. Trump, Rubio, and Cruz—look at your families, your grandparents, your great grandparents. They too were immigrants at one point, and they came to this country searching for opportunities for their families. Stop giving anti-immigrant speeches that only spread fear, we know you are only looking for votes from a minority of voters within your party. Instead of attacks, we need solutions – solutions you can create if you worked together. I am tired of waking up at dawn worrying that my sons could lose everything they have worked so hard for – since they were kids we have taught them to love this country more than their previous home. I am scared that they could apprehend my husband and I during one of these raids – all the hard work and effort we have put forth throughout these past 16 years would have been for nothing. Dear “legal” politicians, we don’t need more fear within the “illegal” community, start working together to improve our nation. Juan Escalante is the Latino Rebels Tumblr editor. You can follow him @JuanSaaa.